Sam Adams said the outpouring of congratulations has been ‘overwhelming’ after reaching 500 appearances for Hastings United Football Club. The popular midfielder reached the rarely-achieved milestone last weekend when he captained the side to a 3-1 victory at home to Whitstable Town. Adams came out on to the pitch with his three children, and presentations were made to him by club president Dave Ormerod, manager Chris Agutter and photographer Scott White just before kick-off. “It was nice to walk out with the kids,” he continued. “They always ask me if they can come out and it was good to do that. Adams remembers making his debut for Hastings as a substitute away to Corinthian-Casuals at the start of the 2005/06 season, although he didn’t recall finishing that campaign as the club’s leading scorer. The 31-year-old had a spell away from the club during its amazing run to the FA Cup third round proper in 2012/13, but was very much a part of the promotion to the Ryman League Premier Division in 2006/07. Adams describes that success as his best moment with Hastings, even though he didn’t feature in the play-off final victory over Tooting & Mitcham United, but believes the current squad is the strongest he’s been part of. 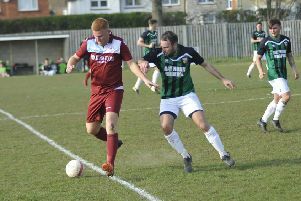 “It’s the best team I’ve played in,” said Adams, who returned to Hastings in the early part of last season after a year with league rivals Hythe Town. “The way we play is so enjoyable to play in. Adams is skippering a Hastings side which currently lies second in the Bostik League South East Division having won 10 of its first 12 league matches. Having got to 500 appearances, the versatile Adams - who says the best of his 130 goals for Hastings was a top corner strike from the right-hand side against Greenwich Borough - is keen to keep adding to his tally for as long as possible. Bostik League South East Division top half (played-points): 1 Cray Wanderers 13-37 (+22 goal difference), 2 HASTINGS UNITED 12-30 (+21), 3 Phoenix Sports 14-25 (+6), 4 Hythe Town 13-24 (+7), 5 VCD Athletic 13-24 (+4), 6 Haywards Heath Town 13-21 (+4), 7 Horsham 11-19 (+4), 8 Ramsgate 13-19 (+3), 9 Whyteleafe 11-18 (+6), 10 Sevenoaks Town 13-18 (0).